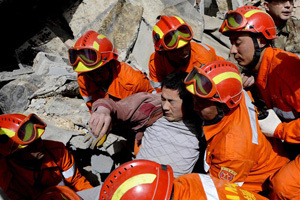 Rescuers carry an injured man from the ruins after an earthquake at the Tibetan Autonomous Prefecture of Yushu, Qinghai province April 15, 2010. The death toll from the earthquake in China’s remote and mountainous Yushu county, Qinghai province, has risen to 617, Xinhua news agency said on Thursday. It is a knowledge that Jinde Charities, which is supported by Caritas, hoped they would not have to ever use. But Wednesday’s Qinghai earthquake means that all they learned from Caritas member organisations following Sichuan will now be put to the test. “We’re currently looking for a base to operate from in Qinghai. This will be a challenge as many buildings have been destroyed. We’re sending a small team in first of all. They will attend to basic needs, offer counselling and will evaluate how we can best help people,” says Fr Paul, who is based in Hebei Province. Qinghai is a remote, mountainous province in north-west China near Tibet. Fr Paul says the great distance involved and also the altitude are problematic. “It’s less than zero degrees at night as it’s still winter there. Many people are sleeping outside. It’s essential that we get food, tents, water, medical care and warm clothes to them as soon as possible,” he says. Over six hundred people have now been confirmed dead as a result of the earthquake and over 10,000 are injured. However, some of the areas affected are isolated and haven’t yet been reached so these figures could rise. Once Jinde has a better idea of how many people need help in Qinghai and what sort of things they need, they will coordinate religious congregations and lay people to attend to the needs in the area. “We really appreciate the support of Caritas members, who have been in contact with us since the earthquake happened. In the long-run, we’re going to need their financial support so we can provide people with items such as food, clothes and medicines,” said Fr Paul. “Following Sichuan, Caritas helped Jinde Charities through training and capacity building. They taught us how to do assessments following disasters, how to monitor progress and structure our work. It has really helped strengthen what we do,” he said.